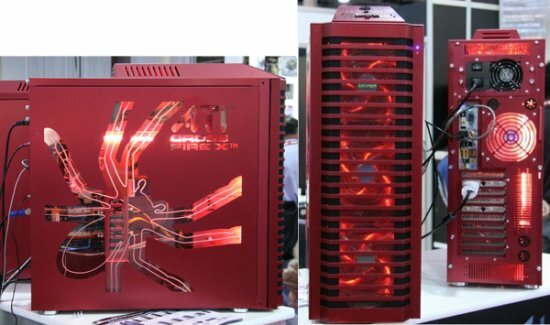 Gizmodo spotted the new Lian Li Armorsuit case at CES 2008. We just checked in with the guys at Lian Li, and we managed to peek a look at their hot new PC cases. The best of the bunch is the Armorsuit enclosure, shown in the image above. It's smoking. The case has a solid aluminum construction (with plastic side windows), nine 5.25-inch device bays (including two 3.5" x 3 HDD cages), three LED fans, LED lined heat exhaust and liquid pipe inlets for solvent cooled systems.